Q: How long does the flight from Beijing to Hong Kong take? A: The Beijing to Hong Kong flight takes about 3.5 - 4 hours. Q: What is the distance of Beijing (PEK) to Hong Kong (HKG) flights? A: The flying distance of the Beijing - Hong Kong and Hong Kong - Beijing flight is 2,289 km (1,422 mi). Q: How much does Hong Kong (HKG) to Beijing (PEK) flight cost? A: The price of an economy ticket of the HKG - PEK flight normally fluctuates between CNY 1,500 - 3,000. Q: How to find cheap flights from Hong Kong to Beijing? A: To find cheap flights from Hong Kong to Beijing or buy a cheap air ticket from Beijing to Hong Kong, we recommend you begin to check the ticket price 3 months in advance and put an order when the discount is satisfying. Or you can use price compare websites like SkyScanner to find the cheapest flights from Hong Kong to Beijing. Besides, the flights departing/ arriving late at night or early in the morning usually have better discount than other flights. Q: In Hong Kong, how many direct flights to Beijing are there in one day? A: Every day, about 19 direct flights to Beijing depart from Hong Kong International Airport. In contrast, flights enjoy shorter journey time and have more departure time to choose from, but they cost more. On the other hand, high speed trains are more cost-saving, also passengers can transfer at Guangzhou and Shenzhen for more choices. Therefore, flights are more suitable for passengers who has tight schedule, and high speed trains are better choices for passengers with enough time but tight travel budget. 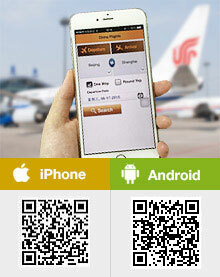 Air China, Hong Kong Airlines, Southern Airlines are all available. How much does it cost for a return flight from Hong Kong to Beijing?? Canada to Beijing to Hong Kong (and back) - what visa's needed? I am a Canadian travelling from Canada to Beijing (staying for a few days), then Beijing to Hong Kong (staying a few days), and finally back again, from Hong Kong to Beijing to Canada. I have a Chinese Visa for entering Beijing from Canada. Do I need another visa for entering/exiting Hong Kong? You do not need HK Visa, but you need double entry Chinese Visa. I'll fly from tel aviv to hong kong. Ill have connection in beijing.lay over time 2 hours. Do i need a visa to china mainland ? You do not need mainland visa if you stay in the airport. It do not matters, there should be shuttle bus between terminals. You can use that. CAN I ASK ....DID YOU HAVE A RECIEVE A FILES FROM MANILA TO MAKE A VISA .. However, we are TravelChinaGuide instead of Airlines or embassy. For your inquiry, we suggest you to contact the Airlines or embassy directly. Hope for your kind understanding.